Newborns come into the world as defenseless creatures totally dependent on their parents for protection. Yet they are also born with the ability to respond to loud, potentially threatening sounds. This response is called the startle response.This alternative name for the reflex comes from the German pediatrician Ernst Moro. The moro reflex is just one of several involuntary movements in newborns. What Does the Startle Reflex Look Like? If you want to see the startle reflex in action simply observe newborns when they feel as if they might fall down or when they hear an unsettling or loud noise, such as a dog barking or a door shutting. When newborns are exposed to startling environmental stimuli, they will instinctively extend their arms and legs, open their fingers and arch their backs. Then, newborns will clench their fists and pull their arms to their chests. Babies exposed to loud noises may also cry, as parents know well. The startle reflex doesn't end with this reaction, however. Babies who hear loud sounds may also experience effects their parents can’t see, such as an increased heartbeat or heavy breathing. Some babies are more sensitive than others. For sensitive babies, even a light touch may bring on the startle reflex at times. This isn't necessarily a bad thing, but it does alert parents to the fact that their little one may be particularly sensitive to sensory input. What If Your Baby Rarely Startles? Most parents will observe the moro reflex accidentally, as loud noises are sometimes unavoidable, especially if you have pets and other children in the home. However, parents should never intentionally startle their child to see if the newborn has the reflex. Also, parents should not be concerned if babies don’t perform the startle reflex in response to every loud noise. This doesn't indicate there's a problem with the baby. The child simply may not startle easily or may do so in a subtle manner. Parents should note that the startle reflex disappears when babies reach about 2 to 4 months of age. If your baby never startles, however, you should contact your health care, provider. This could be a sign that something is wrong with your child’s neurological system. On the other hand, you might not be observing your baby as carefully as you think you are. A pediatrician should be able to determine if a baby's startle reflex is off. It's important to know that the startle reflex is not normal in older children or adults. If it is present, it could be a sign of a neurological issue. 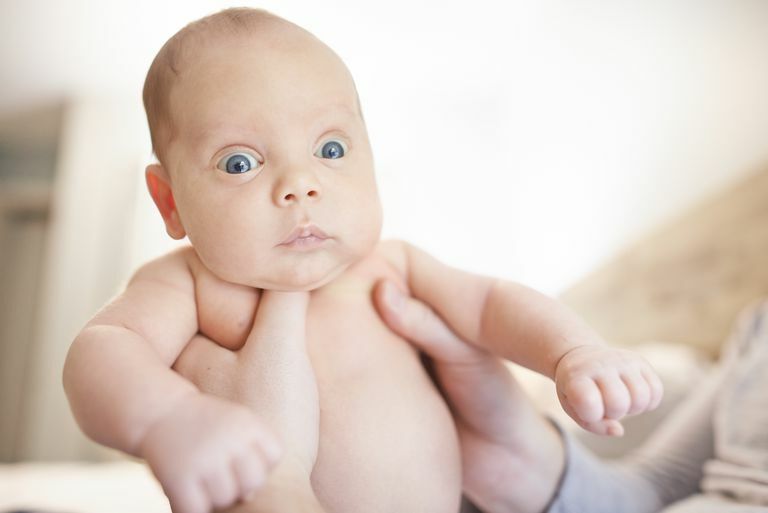 The startle reflex is one of many involuntary movements babies have upon entering the world. These instinctive movements have helped babies bond to family members and get the love and care they need for millennia. Medline Plus. Moro reflex. US National Library of Medicine. Web. 2017.